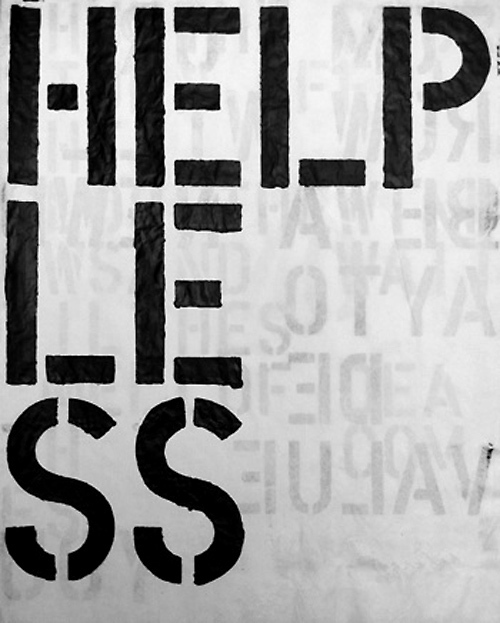 Printed Matter is hosting an ambitious instore exhibition entitled HELP/LESS, organized by artist Chris Habib. The store-wide show includes over 200 works that explore the fluidity of authorship in artists’ books and multiples. A program of hands-on workshops and other events will take place during the exhibition. Including original artworks, book objects, prints and a tremendous selection of artists’ books, HELP/LESS looks to the various modes and methods of appropriation in contemporary art, including: plagiarism, re-authorship, identity subversion, copyism, substration, redaction, curation from the Commons, collective authorship, forgery, theoretical translation, narrative appropriation and reprography. The books gathered in the show represent many of the significant works that have, by choice or not, framed the conversation about fair use, derivation and the nature of contemporary practice. In the spirit of the books, ephemera and multiples it presents, HELP/LESS re-considers the exhibition space as an object to upset. It considers its viewers and featured artists accomplices. The exhibition includes books and other works by: 38th Street Publishers, Kathy Acker, Todd Alden, Greg Allen, Amanda Andersen, Conrad Bakker, Fiona Banner, Judith Barry, Fred Benenson, Harvey Benge, Bernadette Corporation, Jen Bervin, Mike Bidlo, Scott Blake, Christian Boltanski, William Boyd, Bertolt Brecht, Marcel Broodthaers, Stephanie Brooks, Patrick Cariou, Sean Joseph Patrick Carney, Mary Ellen Carroll,Maurizio Cattelan, Marc Camille Chaimowicz, Paul Chan, Clem Chivas, Anne Collier, Diego Cortez, Peter D’Agostino, Anita Di Bianca, Rutherford Chang, Joshua Deaner, Eric Doeringer, Thomas Dworzak, Laura Edbrook, Sam Falls, Hans Peter-Feldmann, Bettina Funcke, Thomas Galler, General Idea, Crispin Hellion Glover, Kim Gordon, Dan Graham, Wade Guyton, Shuruq Harb, David Hammons, Matthea Harvey, Kismaric Heifer, Hester Barnard, Matthew Higgs, Antonia Hirsch, Misha Hollenbach, Stuart Home, Ciprian Homorodean, Glenn Horowitz, Jonathan Horowitz, David Horvitz, Khaled Hourani, Marc Hundley, Jamison Flint, William E Jones, David Jourdan, Steve Kado, Mike Kelley, Brian Kennon, Martin Kippenberger, Joseph Kosuth, Margia Kramer, Tuli Kupferberg, Hyo Kwon, Tanja Lazetic, Antoine Lefebvre, Sherrie Levine, Hanna Liden, Tan Lin, Michael Lobel, Nate Lowman, Sarah Lüdemann, Katou Malou, Nathaniel Matthews, Adam McEwen Jonathan Monk, Simon Morris, Bruno Munari, Bruce Nauman, Olaf Nicolai, Abner Nolan, Soner Ön, Yoko Ono, Denis Oppenheim, Asher Penn, Stephen Perkins, Tom Phillips, Michalis Pichler, Sigmar Polke, Barbara Pollock, Bern Porter, Seth Price, Manny Prieres, Richard Prince, Rob Pruitt, Lee Ranaldo, Gerhard Richter, David Robbins,Torbjorn Rodland, Ed Ruscha, Jonathan Safran Foer, JD Salinger, Joachim Schmit, Andreas Schmidt, Jonathan Seliger, Cindy Sherman,Brian Singer, Leah Singer, Smile Magazine, Dash Snow, Valerie Solanas, Buzz Spector, Chelsea Spengemann, Klaus Staeck, Dan Starling, Superflex, Triin Tamm, Hank Willis Thomas, Mungo Thomson, Visitor, Kara Walker, Kelley Walker, Lawrence Weiner, Werkplaats Typografie, Dirk Westphal, Jocko Weyland, Ofer Wolberger, Christopher Wool, Yes Men, Paul Zelevansky and others. The exhibition runs through September 29, 2012.